For a Kansas City girl there is a shocking lack of smoked foods on this site. Today I rectify that, at least a little and share a recent adventure with you. It may be perfect timing because this is a show stopper dish, and Father’s day is coming up you know! So anyway, back to the beef. This is actually not my recipe at all, it belongs to a good friend and talented chef Gabriel Salazar who was nice enough to share a delicious beef tenderloin and the recipe for it with me. Now I am going to share it with you… aren’t we both lucky? So it started with a beef tenderloin, you know that highly sought after delicately flavored cut of beef from which filet steaks are cut. This particular cut of beef is very tender (hence the name) but boasts a less strong flavor than other cuts of beef, like for instance the ribeye, so it is the perfect foil for a little smoke and some flavorful vegetables. After cleaning the tenderloin, (check this guide) he decided to smoke this roast without cooking it (to add some flavor, so he could cook it however he wanted later.) This is a great technique for adding a wonderful smoky flavor in a short amount of time to almost anything, beef? Obviously. Chicken and pork? Of course. How about some fish? Yes please. Cheese? Mushrooms? Fruit? Yes, yes, and I kid you not yes! Take a close look at the picture below, you’ll see it’s not a smoker but a grill like you probably already own. (Well mine isn’t that fancy but works just the same.) You’ll see a few pieces of charcoal on the left side of the grill. On top of that is a tin can with the top removed. He put a few dry wood chips in a piece of foil, poked some holes in the foil and put the wood chip foil packet in the tin can on top of the lit coals. He then put the beef on the right side of the grill, so that there is VERY indirect heat for 30 minutes, which gave the meat a wonderful smoky flavor! At this point you could make some wonderful smoky steaks by slicing the beef, stoking a bigger fire and throwing them back on the grill, or you could grill roast the whole thing by removing the wood chip can making a bigger fire and putting the beef back on, but that’s not what happened, instead we decided to stuff the roast with a savory mushroom duxelle mixture which not only added to the complexity and the interest of the dish, but significantly enhanced the beefy savory flavor. I wish I would have taken a picture of the butterflying and stuffing of the meat… but apparently I forgot. Blog fail! However, you know the book is always better than the movie, so I’ll just describe the loveliness to you and have faith that your imagination will be better than my limited photography skills could ever be. We sautéed sliced mushrooms in butter with a few herbs. Then the beef was sliced open like a book (yep, flat), filled with the mushroom mixture and rolled up like a pinwheel. We tied it all together with twine, something that most people don’t do too often so don’t beat yourself up if it doesn’t look that pretty. If you don’t want to subject yourself to twine tangling adventures at all you can always hop online and order one of these. Into the oven it went, and the plan was to cook it low and then brown it quickly at high heat after roasting. Good plan but we kept a close eye on things and it was fortunate because my oven decided to work extra well that day and roasted everything much faster than it would have on any other day of the week. (Isn’t that the way?) It was a good reminder that thermometers are more valuable in the kitchen than timers! After an appropriate rest, succulent pinwheels were sliced, loaded onto a not quite large enough platter and served with a caramelized onion jam…yeah, not too shabby people. The result? NO talking. That’s right, the ultimate compliment, just eating, enjoyment, concentration on the pleasure of the moment. That is exactly what I always hope for, something so delicious people cannot take themselves away from it long enough to say anything. Put 4 or 5 pieces of charcoal on one side of your grill, light and let burn until they are hot and white. Trim the beef (following the guide I’ve linked to above OR ask the butcher to do it for you. Take the wood chips and wrap them in foil. Poke a few holes in the foil packet and stuff it into a tin can you’ve removed the top and emptied. Put the tin can on top of the lit coals. Place the beef on the right side of the grill, so that there is VERY indirect heat for 30 minutes. Remove the beef from the grill. It should still be raw. While the beef is smoking attend to your mushrooms. Slice the mushrooms thinly. Mince the shallots or onion. Mince the herbs. Melt the butter over medium heat in a sauté pan and add the onion or shallots. Saute until slightly translucent (2-3 minutes) and add the sliced mushrooms. Saute slowly until mushrooms are golden (about 10-15 minutes). Once the mushrooms are lightly brown add the salt pepper, and chopped herbs. If the mixture looks dry you can add 2-3 tablespoons of white wine, vermouth, or sherry. Remove from heat to cool slightly. Preheat oven to 250F. 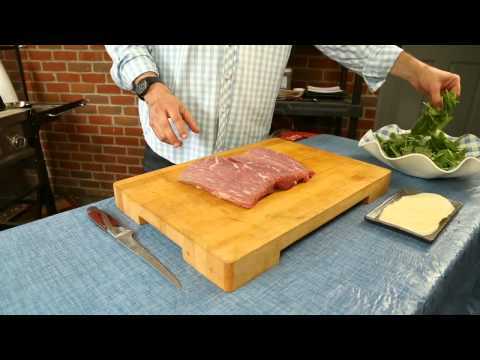 Slice the beef tenderloin lengthwise and open it flat like a book. (See video below). Season the inside of the meat with half of the steak seasoning, dill, and paprika. Spread the mushroom mixture inside the beef almost to the edge. Roll the beef up like a pin wheel or jelly roll, and tie with twine or food loops every two inches. Season the exterior of the roast with the remaining spices. Place the roast on a rimmed baking sheet. Roast tenderloin, uncovered, in the preheated oven for 20 minutes. Increase oven temperature to 425F. Roast for 25-30 minutes or until the internal temperature registers 135F. Remove from oven. Cover loosely with foil; let stand 10 minutes before slicing.